This entry was posted in Campus Announcement, General News and tagged Tree Campus USA on March 12, 2013 by Wire Eagle. AUBURN UNIVERSITY – Auburn University has earned the Tree Campus USA designation from the Arbor Day Foundation for a fourth consecutive year. 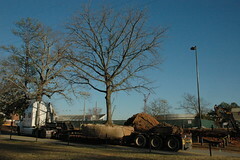 The designation recognizes Auburn for promoting healthy trees and engaging staff and students in conservation efforts. Auburn has supported the Arbor Day Foundation’s five core values by establishing a tree advisory committee, creating a campus tree-care plan, dedicating an annual budget for tree care, establishing an Arbor Day observance and sponsoring student service-learning projects. This entry was posted in Campus Announcement, Community, General News and tagged auburn university, Tree Campus USA on February 23, 2010 by Wire Eagle. AUBURN – The oak trees at Auburn University’s famous Toomer’s Corner are not the only trees getting recognition on campus. The Arbor Day Foundation has honored Auburn University as a Tree Campus USA University for its dedication to campus and forestry management and environmental stewardship. Auburn is the first college or university in the Southeastern Conference to receive the designation.